The theory and practice of education in Japan has changed as the country evolved politically and socially. The current system of education in Japan today was influenced by a combination of United States policy and traditional Japanese values and practices. The fusion of these principles has created a system that is greatly admired throughout the world for its academic success and contribution to the Japanese economy. Currently, there is debate surrounding the system’s ability to change and allow new ideology to take root as well as the stifling effect it has on its students. There are many proposed reforms to the Japanese education system that will introduce new ideas that diverge from tradition, but may be more useful and successful for Japanese students. The earliest forms of formal education in Japan began with the introduction of the Chinese writing system in the 5th century. Written language allowed the aristocracy to study Confucian and other Chinese classics in Daigaku-Ryo, a school for court nobility in Heian, or in Kokugaku, branch schools for the provincial aristocracy. During the ninth century, the development of kana, or written syllabaries, led to a national Japanese written language. This allowed the focus of education to extend beyond Chinese influences. Another form of education in medieval Japan was the study of the bushido code by samurai warriors. This code instilled values of absolute loyalty to superiors and individual self-discipline, which are values that are carried through to Japan’s modern education system (Ellington 15). Japan’s system of education truly developed during the Tokugawa period, beginning in 1600. Throughout this period advances were made in education by the creation of 17,000 educational institutions and the development of a publishing industry. The educational system of this time was a product of the current political system that was based on class divisions. Samurai received a strict and difficult education in the fief schools. They studied topics ranging from Confucian ideals to military skills. The focus of samurai education was the moral development of the student, not the practical implication of the skills learned. Commoners in Tokugawa Japan also received an education similar to the samurai. They attended Terkoya, temple schools in which 30 to 60 students learned to read and write Japanese, as well as focusing on moral and vocational topics. The main difference between fief schools and terakoya was that the schools for commoners provided practical skills that were expected to be used in real life. During this period, 1,500 institutes of higher learning, shijuku, were developed. These schools offered topics from Confucianism to Western studies and engineering. Most importantly, shijuku began to award students on the basis of merit instead of class, a distinct difference from the hierarchical system of the Tokugawa (Ellington16-20). Radical changes in the education system began during the Meiji Restoration. A main focus of the Meiji government was the Westernization of Japan, which can be seen in its policies on education. The September 1872 Fundamental Code of Education established a centralized national education system which concentrated on Western science and technology. The Japanese government drew heavily upon the aid of Western nations, specifically France, the United States, and Germany, when developing and implementing new educational policies. In the 1880s, the government began, once again, to focus on creating loyal Japanese citizens instead of Westernizing. The 1890 Imperial Rescript on Education established the moral foundation for schooling and relied more heavily on Confucian ethics and group-oriented values than on Western thought and technology. Mori Arinori, the first Minister of Education, established an education system that combined the Confucian and Western ideals to create a meritocracy-based environment (Ellington 21). During the Meiji era, there was compulsory education for six years at the elementary level and another two of upper elementary schooling. After these required years, students had different educational experiences based on gender and abilities. Females were prohibited from receiving upper level education, but had the opportunity to receive vocational training. For males, there were many different options, including youth schools and middle schools. Youth schools were not part of a formal education and students received vocational and military training. Under Mori, a system was devised that created two-year and three-year middle schools. Students had to participate in competitive examinations, much like entrance exams, in order to gain admission to the school of their choice. Admission to a three-year middle school practically guaranteed a student admission into the very elite universities (Ellington 24). The next step in the reformation of the education system came with the American Occupation of Japan following WWII. Americans saw education as a way of instilling democratic ideals in the Japanese people. The strict education that Japanese students had received in the school system was suspected to be a cause of the highly militaristic society. Since many Japanese were anxious to remove themselves from this militaristic mindset, they welcomed the changes that the United States Education Mission to reform education provided (Inoue 6). Under MacArthur, this mission recommended a complete overhaul of the Japanese system with the objective being to create an American based system. With no prior information about the Japanese culture and practices, the mission recommended changes such as democratization, the replacement of moral education with social studies, and the abolishment of the Japanese writing system. Many of these changes did not succeed because of the major clash in culture, but many facets of the reforms still exist in the Japanese education system today. The American 6-3-3-4 grade sequence, democratic instruction, equal opportunity and nine year compulsory education remain as current components of the Japanese education system (Ellington 27). 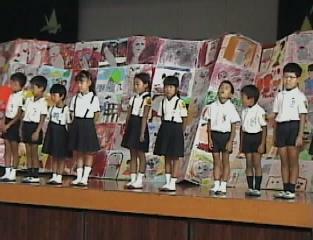 The Japanese education system has received much praise for its successes. The Japanese economy boom that began in the 1960s was directly linked to the education system. The focus of many of the schools was science and technology, which led to advancements in these fields. Traditionally, Japanese students have achieved greater scores on standardized tests, especially in math and science, than Americans and many other nations of the world. For example, Asian student received an average score of 566 on the SAT’s, while white students received an average of 531 in 1990(Asians 1). The Japanese model of education was exemplified in “Nation at Risk”, a report by the U.S. Department of Education in 1983. This report suggested policies such as standardized curriculum, repetition and testing to achieve higher attendance and success, policies that have been prominent in the Japanese system of education (Hidenori 2). Despite these positive attributes generally associated with the Japanese, there is a strong movement toward reforming the education system. Recent violence among student populations has encouraged policy makers to examine the current system and attempt to create one that focuses more on the individual needs and basic human rights of students. Although changes in the current education system began with the Nakasone reforms of the 1980’s, recent debate has centered around the issue of teen violence, especially violence in the schools. Violence has been an exceeding problem; students have been verbally, sexually, and physically harming teachers, classmates, and total strangers. Some argue that these recent problems with aggression can be traced to the immense pressure placed on the students to perform on standardized tests. “Encouraged from early childhood to think of themselves as the victors in a race to succeed in school entrance examinations, more and more of these future leaders of society are developing thoroughly arrogant and coldhearted personalities (Horio 13).” Students are required to take entrance exams for senior high school as well as college, which are very competitive in nature. Students are expected, by their families, to study for these exams which creates a market for juku, or cram schools, where students spend extra time preparing for exams (Hidenori 1). It seems that the competition among peers, the stress of doing well, and parental pressure are all factors that have caused the recent problem with delinquency. There are other concerns regarding the Japanese education system that refer to the discipline and order that students experience in the classroom. 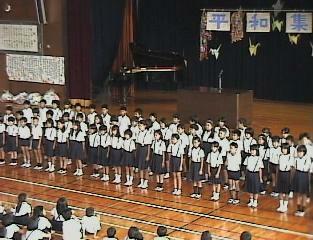 Contemporary Japanese society values order and adherence to tradition, which is evident in classroom policy. Management of student’s clothing, self-expression, and content of study are extreme, so much that students received physical punishment for any deviation from the rules. Teachers also encourage the bullying of slower students to achieve order. This corporal punishment, taibatsu, and bullying, ijime, that are present in the classroom form an environment that is extremely rigid and does not allow for departure from the norm or individuality (Horio 15). Finally, in terms of curriculum, Japanese schools are criticized for concentration on rote memorization and successful completion of standardized tests. This type of curriculum leaves no room for individual learning styles or a feeling of self-responsibility or pride. In January 1997, Prime Minister Hashimoto Ryutaro called for reforms in many areas of government, including education. The Ministry of Education had been working since 1995 and the National Commission on Educational Reform was created in March 2000 to establish proposals for reform. The Education Ministry developed three primary goals for the reforms to take. The goals include “enhancing emotional education, realizing a school system that helps children develop their individuality and gives them diverse choices, and promoting a system in which the schools’ autonomy is respected (Yasushi 1).” With these goals in mind, concrete changes were proposed, such as combining middle and high schools to eliminate the pressure of entrance exams. The National Commission on Education, while following the same principles as suggested by the Ministry, provides more concrete suggestions for reform in schools. For example, the Commission recommends that students be required to participate in two weeks of volunteer services in elementary and middle school, and a month of service during high school in order to promote “emotional education” (Yasushi 2). These reforms are expected to address the problems in Japanese education today and create a more individualistic style of education. There are those who are opposed to changes in the current education system of Japan and do not think that reforms are the solution for solving problems with student violence and apathy. First, the media presents the problem of youth violence in Japan as an extreme that is caused by the education system. In truth, most Western nations experience this same problem, even though their education systems are less rigid and allow for more individuality. There is no clear evidence that dissolving the strict guidelines will curb the violence in the culture. Also, critics have focused on extreme incidents to describe youth violence in Japan, despite surveys that have suggested that 80% of students enjoy going to school and are not overstressed or afraid (Hidenori 4). In addition, the reforms suggested for independent learning, such as reduced time in class and different curriculum, seem illogical. Fewer hours in class and diminished content in the curriculum do not appear to be solutions for improving scholastic success (Hidenori 4). The current system of education in Japan exhibits elements of the past organizations of Tokugawa, Meiji, and Post 1945 Japanese education. The obvious foreign involvement, such as implementing Western ideals of individualism into the school system instead of continuing in tradition can be traced to both the Meiji and Post 1945 eras of education. In order to continue a successful system of education, Japanese reformers much take into consideration the changes that have been made in the past as well as current problems. “Asians score higher in U.S. standardized achievement tests.” Japan Economic Newswire 29 Aug. 2001: International News. Lexis-Nexis. Online. AOL. 9 Apr. 2002. Ellington, Lucien. Education in the Japanese Life-Cycle. Lewiston: The Edwin Mellen Press, 1992. Hidenori, Fujita. “Crossroads in Japanese Education.” Japan Quarterly 47 (2000): 49-55. ProQuest. Online. AOL. 9 Apr. 2002. Horio, Teruhisa. Educational Thought and Ideology in Modern Japan. Toyko: University of Tokyo Press, 1988. Inoue, Kyoko. Individual Dignity in Modern Japanese Thought. Ann Arbor: Center for Japanese Studies, 2001. Yasushi, Tokutake. “Educational Reform.” Japan Echo 27 (2000): 6-7. ProQuest.Online. AOL. 9 Apr. 2002. Articles discussing critical issues of current Japanese education and children’s situations are presented here by Japanese educators, academics, and professionals. As a report from the National Institute on Student Achievement, Curriculum, and Assessment, this website offers statistics and discussions comparing the Japanese and United States systems of education. This website offers the firsthand experience and opinions of Joel Weierman, an American teaching English in a Japanese Junior High School. Explains its major policies and posts a chart of its organizational structure. Offers a database of press releases dating back to 1996. A multinational group of scholars attack Japan's new pro-militarist history textbooks.